The Virtual Vision Eyeman was a head-mounted spectacle-like apparatus which displays a video image to the wearer. But only in 1 eye. 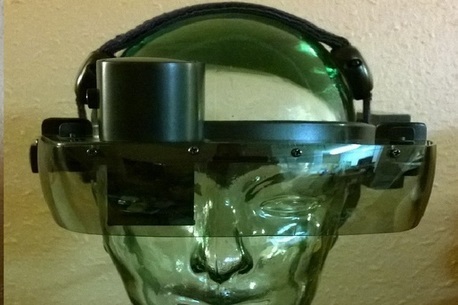 This unusual head mounted display was a monochrome screen, but there was a small video converter that come with a program that converted VGA and AV-video format HMD. A full trademark for the EyeMan was filed in 1992 and registered in 1994, but the release date of the headset was quite late in late 1994. While it won’t be blowing anyone way, there was still some amazing features about the Eyeman. For one the white monochrome screen made it affordable as well as a lot lighter compared to other HMD’s of the time. It also had focus adjustment switches at the top of the eyepiece which moved the LCD screen up or down meaning it could be adjusted to suit most people. But sadly the LCD-screen they choose had severe malfunction problems and it often gained annoying white pixels all over the screen.